Take a trip to see what’s new. For years, my fantasy was to live a second life with Ingrid Bergman’s looks and Grace Kelly’s wardrobe. For readers with similar notions but who don’t have time to wait for reincarnation, a new shop in Bryn Mawr Village has a partial solution. Kirna Zabête sells Mark Cross box bags—fabulous purses rendered iconic when Grace Kelly opened hers to reveal lingerie for an overnight stay in the 1954 movie Rear Window. Pull out your credit card and bring that bag home. Whether you’re Princess of Monaco or queen of your own castle, there are great new finds in the area. Along the Main Line, passionate fashionistas, baristas and pioneers are bringing world-class goods and foods to our doorstep. Milanese dresses, Kenyan coffee beans and Sichuan-Taiwanese dumplings are yours without renewing a passport or catching a plane. I went, I sampled, I loved. 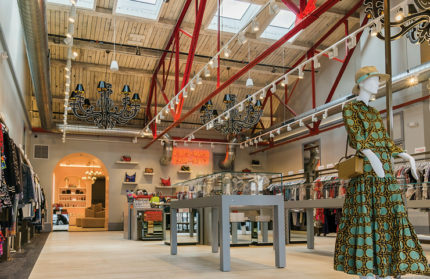 Kirna Zabête is the area’s newest hot spot for sky-high fashion and just one reason to visit Bryn Mawr Village’s mixed-use complex anchored by the Old Bryn Mawr Garage. For a complete designer experience, gaze up at the shop’s Orsman-designed lighting and chic chandeliers that match those of the flagship store in Soho. Select Gucci slippers or top-selling Golden Goose sneakers. Between trying on styles designed by some celebrities and touted by others, lounge on a sofa of perfect red (owner Beth Buccini’s favorite color). Statement pieces—with loads to say, in fact—range from $4000 Rosie Assoulin dresses to $40 Izipizi reading glasses. 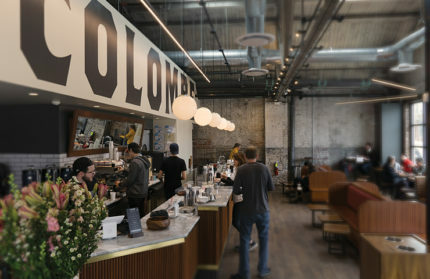 Next door to Kirna Zabête, coffee lovers flock to an old favorite in a new location—the 17th and most recent addition to La Colombe. The atmosphere—funky exposed beams and bricks of the building that was once a SEPTA bus garage—sets a driving vibe while the coffee and conversation get your energy going. Meet friends at the café to indulge in the day’s brew and croissants, baked locally and served on colorful Italian Deruta ceramic dishes designed especially for La Colombe. Take home some ethically traded beans. 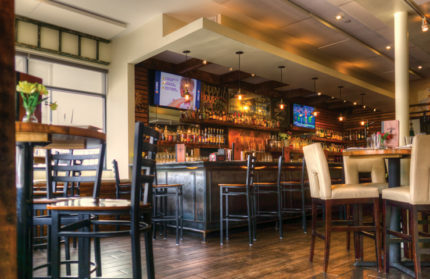 Cross the parking lot for brunch at Turning Point—a bright, airy spot for a chocolate chip shake-a-chino, eggs benedict with Cajun hollandaise sauce or OMG French toast. Consider a final stop before leaving Bryn Mawr Village at Athleta for trendy sportwear and the latest in athleisure wear—a newish venture from The Gap. About a block west on Lancaster Ave. you’ll find the newest brewpub to add to our well stocked lineup—that’s the newest as of press time! Tin Lizzard Brewing offers house brews, barbeque and wine from Ferro Winery in Lewisburg, PA. Check out the inventive beer names like Clock with No Hands and Caught Up in You (American IPAs) and Allegory of Sight (witbier). One more fashion shout-out for Bryn Mawr. If your chosen way to start the day is by putting on the best earrings ever, venture out to the newest location of Louella. The Bryn Mawr addition offers the same bright colors and bold prints as the shops in Malvern and Wayne, but also caters to slightly younger and fashion-forward crowds. To go with Lisi Lerch tassle earrings or PowerBeads by Jen, grab hot pink suede sneakers, date-night tops to go with denim, or colorful Trina Turk threads. For a weekend destination with shops for browsing, spas for pampering and restaurants for satisfying culinary curiosity, check out what’s new in Wayne. Strike up a conversation with staff members, who are well-versed in what pages are worth sticking your nose into. Join a book club: fiction, science fiction, poetry, even a cookbook club. And be sure to buy a book! So she took a class—yes, really—and bought Borders’ old shelves, then started Main Point Books. The independent shop is coming up on its first birthday since it moved from Bryn Mawr to Wayne. Next pop across the street and delight your sense of taste at The Goat’s Beard. With warm weather comes some new salads and appetizers plus seasonal bestseller fish tacos—tortillas stuffed with red snapper, red cabbage slaw, lime, cilantro and house-made crème fraiche. For a twist on an Indian tradition, dive into vegetable coconut curry with saffron couscous, new potatoes, curry and coconut milk. Spring at The Goat’s Beard also features its 40-seat patio (it’s in the former Xilantro space). On Sundays, indulge in a half-priced bottle of wine or champagne for sipping sunny mimosas. Three entrepreneurs asked: If you opened only one brewpub in your life, why wouldn’t you pour all your creative energy into making it the most thrilling, comfortable and creative brewery? Brewer Dan Popernack, Chef John Hearn and General Manager Chuck Golder brought their individual talents and a passion for each other’s to the table and ended up with La Cabra Brewing. The Latin-inspired gastropub in Berwyn with a great happy hour has guests coming back for seconds … and thirds. This season, the La Cabra team also steps out to pour for beer lovers at area festivals. Don’t miss their Maibock release. There’s something fun about discovering a new place and reminding people you were there first. Past an unassuming entrance of The Greyhound Café in Malvern, the food and atmosphere are worthy of exploration. In a simple room adorned with sculpted greyhounds, I started with the signature salad—a tangy, kicky twist on a classic Caesar with pico de gallo and crispy tortilla chips. I also sampled crab cakes that were divine—but didn’t have a lump of crab in them. Like all the food in the café, the meat substitutes are plant-based. Want one more? Visit DanDan, a restaurant that promises heat to make summer seem cool. The newcomer to Devon (in Ella’s former spot) is set to dish up Sichuan-Taiwanese dumplings and noodles under globe lantern lights that match those at the original Rittenhouse Square eatery. No doubt. Ingrid Berman and Grace Kelly’s fantasy second lives had my day planner and car keys.